Wow Sylvie this is absolutely gorgeous I love the embossed ones and that die cut one is FAB, super, super Christmas card. Super dooper Sylvie! How elegant..love the blues, just gorgeous! Wow Sylvie this is stunning! Love that die cut snowflake, just the perfect touch. Great card...you certainly put a lot of work into your card....beautiful..
Beautiful! 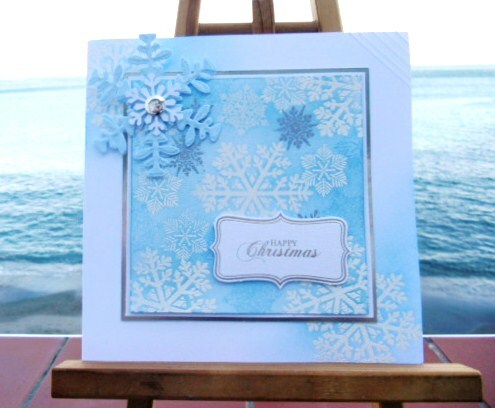 I love the delicate feel of your card with the shades of the blues just adding to the depth of it. Oohhh this is stunning Sylvie. Love the icy blue and gorgeous snowflakes. So pretty - I wish we would have snow!